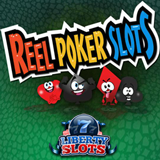 Try the new Reel Poker Slots poker-themed video slot at Liberty Slots and get a $5 freebie! Reel Poker Slots has five pay-lines, each with its own full deck of cards. The new game from WGS pays out for the same five-card winning combinations as a regular poker game. A Straight pays 13X the coin bet. A Royal Flush pays a whopping 10,000X. Reel Poker Slots has three jackpots. The Minor and Major jackpots are random and can be triggered at any time. A sequential Royal Flush wins the main progressive jackpot. The Minor jackpot must be won by the time it has built to $75 and the Major jackpot must pay out when it reaches $750. The closer the jackpot gets to the ‘Must Win’ balance, the higher the chances of winning on any spin. New game from WGS is a poker-themed video slot. Valid until December 31st 2016.